Slowcarfasthouse Expose’ installment three- Money on the Move part two | It's not a slow car, it's a fast house! A few weeks ago I posted a blog about “Money on the Move”. That one talked about the costs of our travel as full-timers in the van. (Here is a link to that post- http://slowcarfasthouse.com/2015/01/04/slowcarfasthouse-expose-second-installment-money-on-the-move-part-1/ ) Part two is about how we manage the money in terms of obtaining, storing and a bit about safety. Obtaining our money in Mexico begins with our banking system in the USA. We did a lot of research to find a banking partner that would allow us to move about internationally without locking down our cards and without charging us ridiculous money exchange rates. We found that Charles Schwab was the most international-friendly company out there. Not only are all fees refunded to our account at the end of each month, they do not charge conversion fees or monthly service fees. We did have to invest some cash up front to open this type of account, but it has been worth it thus far. While we were here in Baja we had a card used fraudulently and they worked with us (as best they could) to solve the issue. That included accepting international collect calls from us when we needed to discuss the card fraud and solutions. Not only is their customer service good, but we can take care of nearly every issue through their on-line portal. Being able to bank on-line is critical to us. In general we are pleased with Charles Schwab as our primary account service. We have another account in the US that our checks are deposited directly in to. With this arrangement we can go online here in Mexico and move the funds around as needed. That gives us two credit cards; two debit cards and two accounts to use- just in case trouble strikes one of the accounts. This allows us a safety net and a system of checks and balances. We also have a person in the USA that has power-of-attorney for emergencies with our banking system. This system is working well for us, but each traveler should research this matter extensively and feel comfortable with their solution. Withdrawing our money while in Mexico is fairly simple. 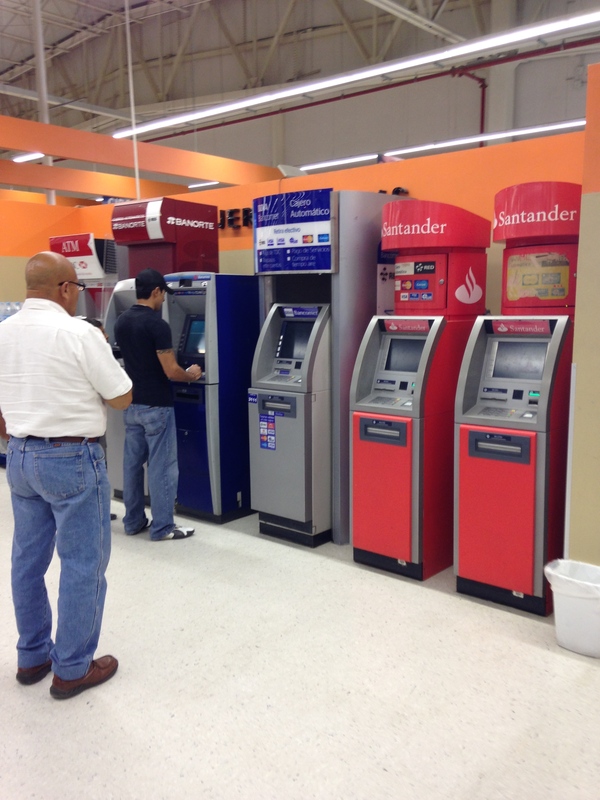 We simply locate a “cajero automatico” or ATM and withdraw Pesos. At a 14=1 ratio, we are getting more for our money than ever before. Generally with withdraw enough cash to last us for a week or more. Once a large amount of cash is withdrawn, it is secured as described below. There is generally a wide range of bank machines available. With our banking set-up, we can use any brand for our withdraws. Once the cash is obtained we put a little in each of our “dummy wallets”. These are the wallets we grab when we are going in a store. These wallets are described below. The remaining cash is split between two locations on the van. One is a secret canister. You remember those oil cans with the screw off top that were hollow inside? Well, it is like that, but NOT an oil can (just to save you some time when you go rifling through our stuff). Just to appease you worried ones, I am not going to tell you what the can actually looks like- we need to keep a few secrets! We generally keep a few hundred pesos in the undisclosed secret canister. The other half of the money goes into the locked safe. 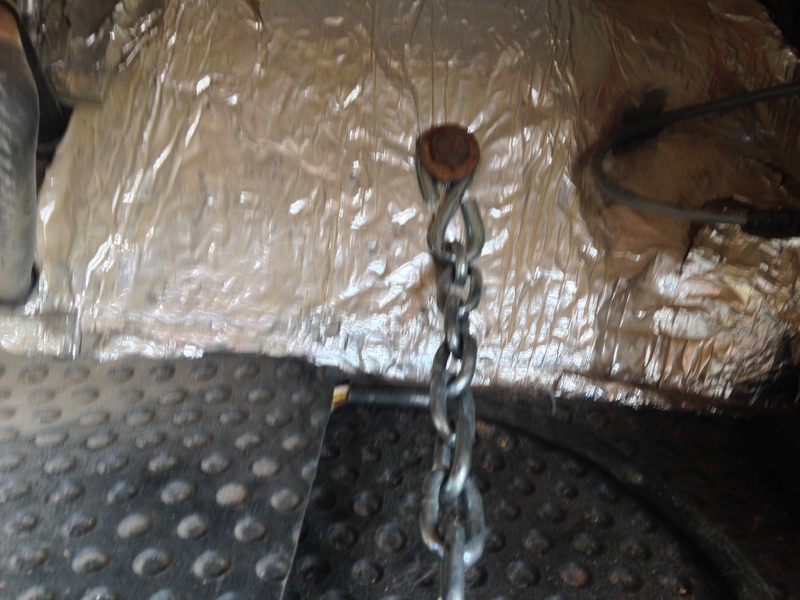 We have secured a safe in the van using a chain. 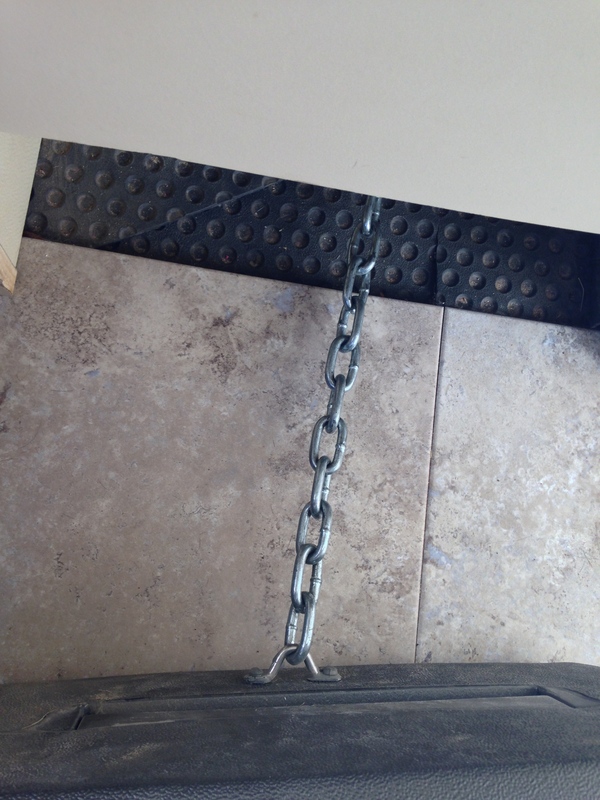 The chain is bolted to the body/frame and welded to the safe. The safe is tucked away under the bed, and behind the dog. Actually the oldest, largest dog spends most of the day with her chin resting on the safe. If an intruder could get past the other dogs, they would also have to get Seri to move in order to even notice the location of the safe. Not likely that it is going to be targeted. While we are talking about security, we also do a few other things to help reduce our risks. First and foremost, we keep all valuables out of sight. 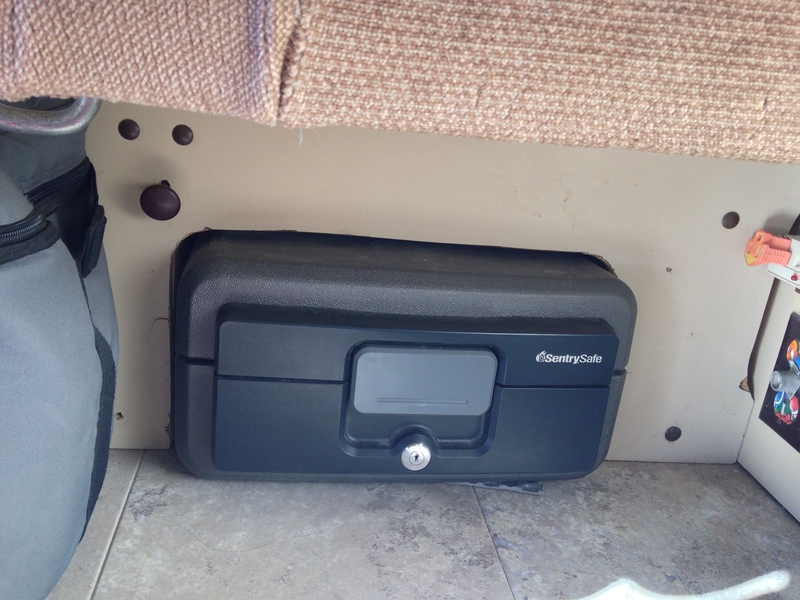 If the computer and iPad are not locked in the safe, then they are tucked away under some blankets and dog food. The GPS comes off the dash when we park and the iPhone is never in sight of the windows. We also carry “dummy wallets” with us when we are out. In addition to the small amount of spending money, they contain a few bogus cards such as an expired drivers license and an old bankcard. These items have little or no value, but look genuine and would hopefully satisfy a petty thief. The “real” ones of these items are locked in the safe or carried in a different location. The concept of a “dummy or drop wallet” is not new, and many people use them even in the US cities to avoid losing their genuine items. Just always be sure to offer up the right one in the event of a hold-up situation. Probably our greatest security system is the dogs. 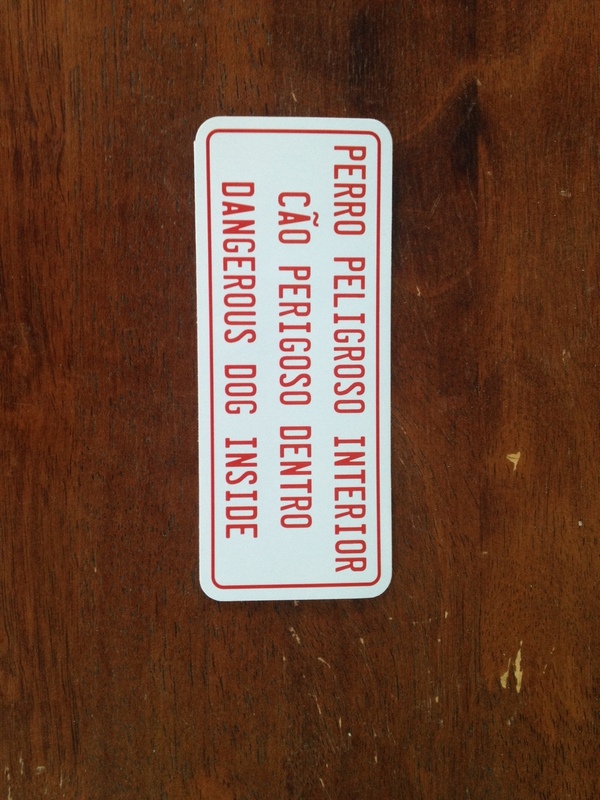 We have the stickers on the windows, which warn people of the dogs. I hope this info can be helpful to a future traveler, or proves interesting to you. As always, please let me know if you have any questions. Thanks for reading and following our blog! I do enjoy reading your post and am so envious. Maybe someday.. Thinking of you both as I walked through the Buses by the Bridge in Lake Havasu. I bet there was over 300 vehicles there. Bigger than I remember from two years ago.